Enzoani, designer of world reknowned wedding designs, held a 2012 line fashion show at the Ritz Carlton - Spencer Bezy, part of the team of heavy hitters brought in to facilitate the show. 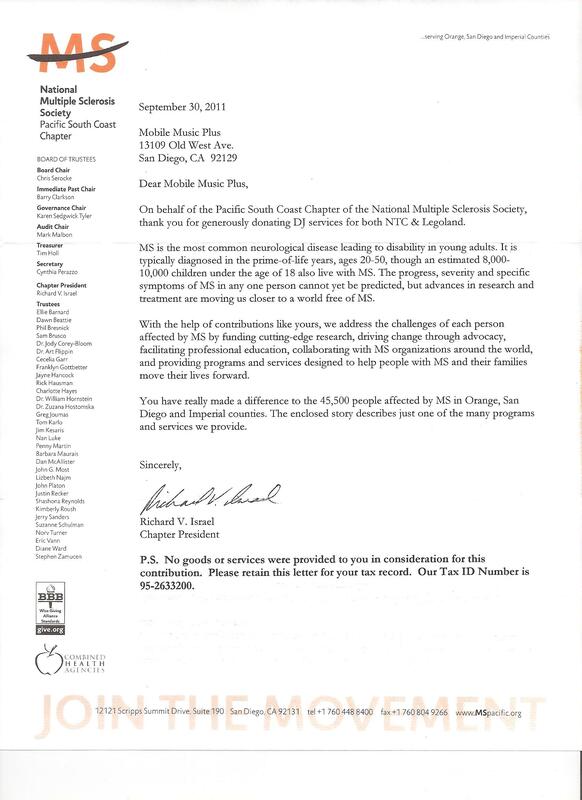 Mobile Music Plus once again supports the MS Walk at Legoland in Carlsbad, CA and along San Diego Bay the following day. Each year the walk contains multiple rest stops for the thousands of participants to stop and get water and small energy food items. Spencer Bezy of Mobile Music Plus once again provided musical entertainment for Rest Stop #2, providing a upbeat, family friendly mix of music to keep walkers lively and motivated to finish the course. Mobile Music Plus has supported the MS walk annually since 1998. 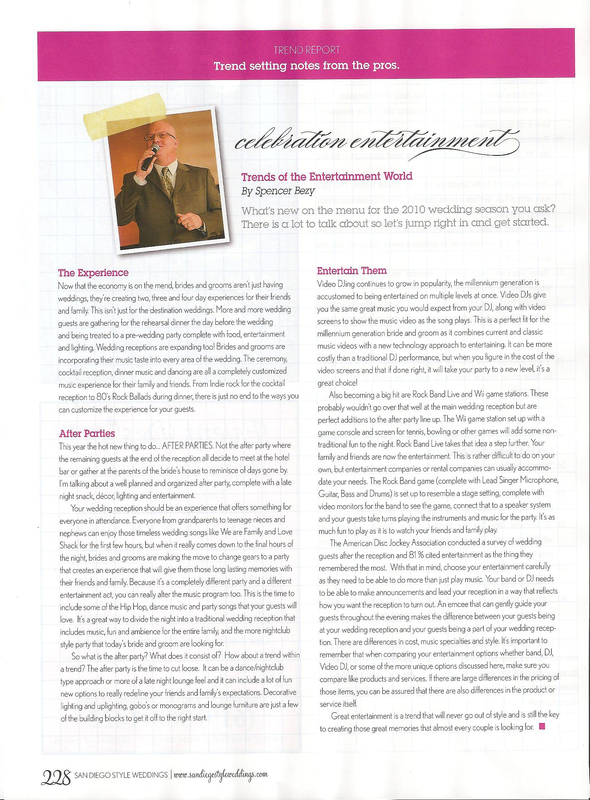 I was asked by the publisher of San Diego Style Weddings Magazine to write a short article about Trends in Entertainment for the 2010-2011 wedding season. The San Diego Association of Bridal Consultants held their first annual Masters Gala. Spener Bezy was among the honorees selected for his accomplishments as a Wedding Master of Ceremonies. Scheduled to Speak at "The Special Event 2011"
Guest speaker at TSE '11 - Music Royalties - Who has to pay them, when and to whom. Event Professionals West Coast Conference, offers something for everyone. Slotted to Video DJ at "Mobile Beat 2010"
Look for Spencer and the Video DJ Article in the Next issue of Bride and Bloom Magazine and Also San Diego Style Weddings Magazine. Spencer Bezy, owner of Mobile Music Plus, has been performing as a Disc Jockey/Emcee since 1991 at a variety of events including weddings, bar/bat-mitzvahs, corporate events, private parties and school dances. Through that experience he instills a sense of excellence in all Mobile Music Plus events. January 2009 - Spencer was featured as the Video DJ and Master of Ceremonies at "The Special Event 2009" an international tradeshow the features the best that the special event industry has to offer. From Entertainment to flowers. 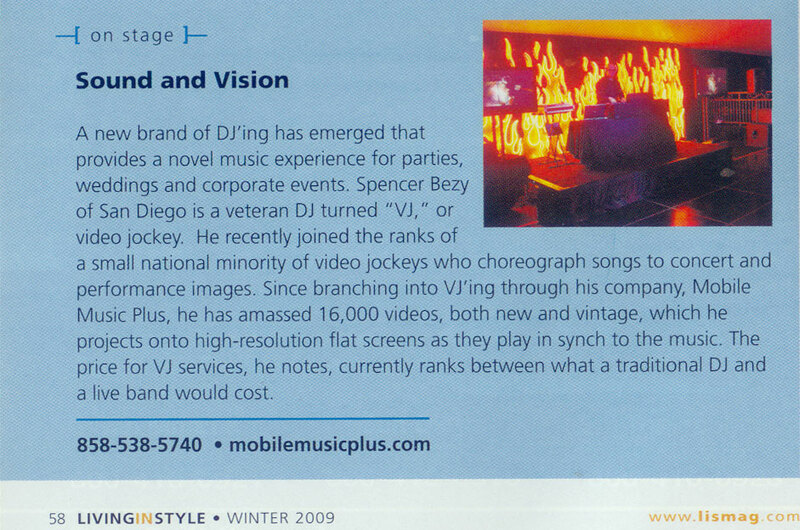 Spencer Bezy of Mobile Music Plus has redefined the whole idea of wedding music and entertainment. With over 10 years of professional DJ experience on local radio stations, Spencer is more proficient at music than anyone else in San Diego. As a polished, well spoken Master of Ceremonies with style and grace, he's unmatched. A new brand of Dj'ing has emerged that provides a novel music experience for parties, weddings and corporate eents.